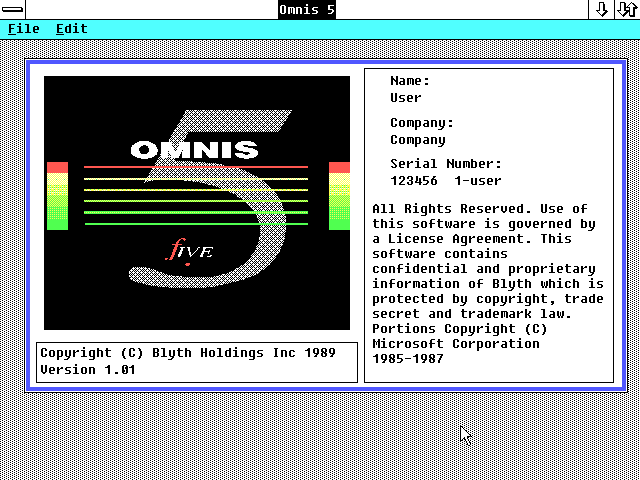 Omnis 5 is a database for Windows 2. Omnis, created by David Seaman of the originally UK based Blyth software, started out as an Apple II database application written using Apple Pascal. Omnis version 1, 2, and 3 were for the Apple II. Reportedly, there may have been an early version for MS-DOS. Omnis 3 Plus was later released for the Mac. 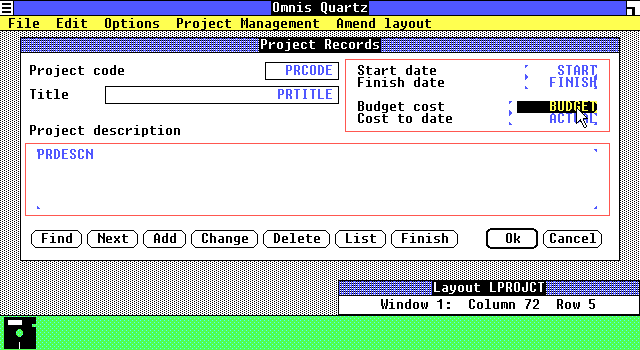 Omnis Quartz (released in 1987) was the first port to Microsoft Windows, and ran under Windows 1.x. This version, Omnis 5 released in 1989, was available for Windows 2, Mac, and OS/2. 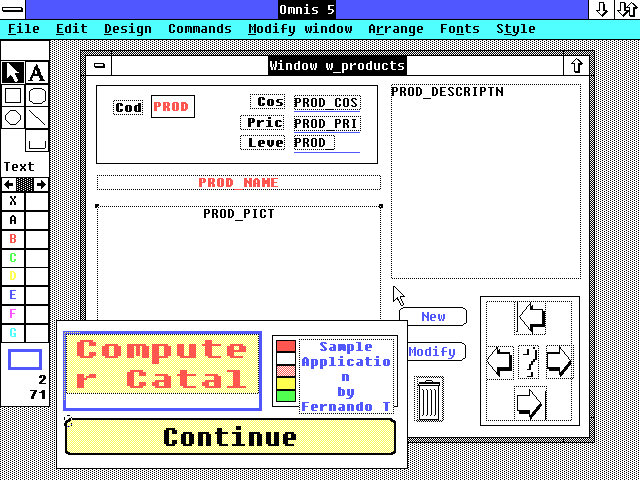 I've mentioned how AMI Pro beat Microsoft as the first full word processor product for Windows. Omnis is yet another example of a third party beating Microsoft to their own platform. And Omnis 5 wasn't even the first Omnis release for Windows! -Omnis 5 can even use the same data files shared over a network by machines of different types. -Supports PC AppleShare, TOPS, 3COM, and Novell networks. -Runs under Windows 2.x, and includes a Windows 2.1 runtime for those without. Omnis 5 features a GUI based data, form, and report builder. Its organization is a little odd. Different visual objects, such as menus and forms, are referred to as "formats". It includes several sample applications. Opening an application runs it, and you may select a menu option to return to design mode. Applications can do a variety of things in this environment, although scrolling through custom data forms is the most obvious. Notably, fields may contain text, numbers, dates, and graphics. A bit of Macintosh style is present in the sample applications. For example dialog boxes contain the mac-like icon of the face with a speech bubble. I still haven't gotten my head wrapped around its programming language, but you may place your own code behind the actions of each control. It looks like a relatively complete language, but it seems to be built like one might build macros - pointing and clicking at command lists and dialogs. Over all it looks fairly flexible, and comparable to other Windows desktop databases. This version was released not too long before Windows 3.0. It sounds like there may have been an update for this version that added Windows 3.0 protected mode compatiblity. And there were later releases for newer versions of Windows. In fact unlike many products and companies on this site, Omnis is still around in the form of "Omnis Studio" and the company is currently known as "TigerLogic Corporation". But the following 3.5" disk image seems to be problem. I can fix this problem, but the disk must be re-dumped to verify. However, they are that way on the original disks. :shock: These were new and unopened, and looking at the stream dump using HxC, these have not been altered. They were mastered that way! Must not have noticed that because I was testing with the 5.25" images. I wonder how the blazes they borked up that readme? I compared all files both 5.25" and 3.5" disk images. If you dump it by Kryoflux (TransCopy) or Teledisk, I can see the attribute of each track/sector. That's amazing. I haven't thought about Omnis 5 in years! Back in the day I actually created a lot of business apps using Omnis. I even created an application for Microsoft for forecasting their OEM business that ran across their own leased line network (before the Internet). Their US headquarters were in Foster City, CA. Welcome to Winworld! It is always great to hear from those who actually used these programs! First, i noticed that the Forth Runtime 5'25 Disk picture is in fact the Third one (so the picture of Disk 3 is available 2 times, but not Disk 4). Other thing : I tried the best i could but couldn't succeed in launching this app, neither with a 3'5 install nor with a 5'25 one. 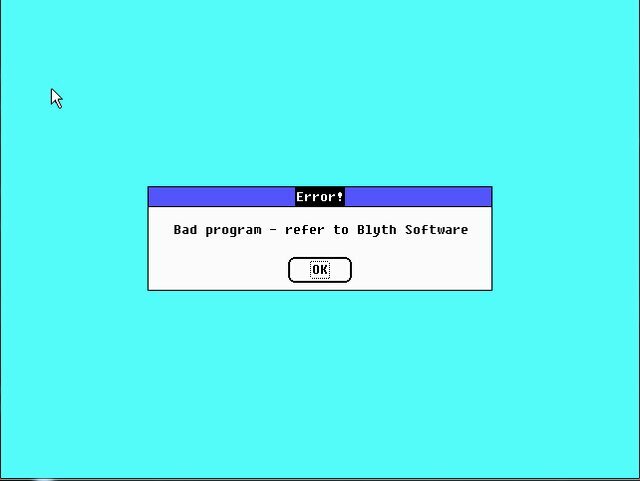 Everytime i got a "Bad Program contact Blyth Software" and can't even make it to the serial screen. Has these images been tested and on which configuration ? Thanks for pointing out that incorrect disk picture. (Someone actually looked at it! Yay!) I'll probably just leave that for now since it is not critical. I did test that in QEMU. It is quite possible that Windows 2.1 might get confused in some environments. If the Windows 2.1 runtime ask to install memory management stuff, be sure to skip that. The HIMEM.SYS in DOS 5.x or 6.22 supersedes what Windows 2.x provides. Where exactly does it stop? During install? Launching Windows? Did you already have Windows 2.x installed or are you using the runtime? Also, keep in mind some emulators or virtualizers only support 1.44mb disks. If that is the case, you can resize the images using WinImage. I tested PCEm and Mame with various configuration (286/386), with Windows 2.1 installed, or with the runtime given with the disks, but it always got to the same point, when Windows is launched (either by me or by the launcher of the runtime version), it errors when the Omins5.exe is launched by a "Bad Program contact Blyth Software". I always used DOS 3.3, i'll try with DOS 5+, but i doubt it's the problem. I'll report my results. If you succeeded to install it, can you give the OMNIS5.EXE you obtained ? Well thats odd. I re-tested the copy on the server just to be sure, and it all installed and worked fine for me. On DOS 6.22 you did remember to load SETVER and add an entry for application "WIN200.BIN" version "3.40"? Wow, that's crazy... No, i didn't forget anything like that, it's all there in the setver list, and the driver is loaded. Alright! 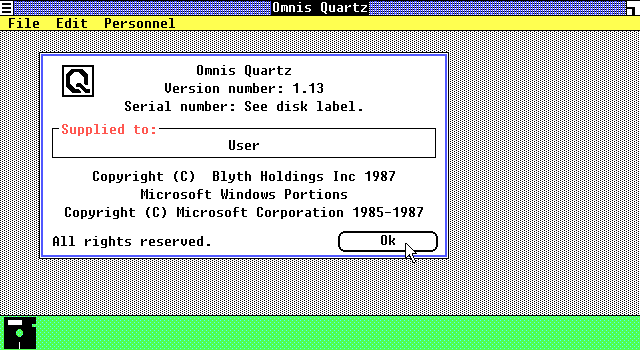 Now we have Omnis Quartz - a database for Windows version 1! It comes with a Windows 2 runtime (Stand Alone Edition), but that is missing some files, and the setup.inf has various problems. (it tries to include msdos.exe but that is not part of the runtime version, and the disk numbers do not match where files actually are). It looks like someone just slopped runtime files on there and failed to update them or properly fit them on the disks. I suspect it was shipped that way, especially given the problems with Omnis 5's runtime. At any rate, just use a regular copy of Windows 2 or Windows 1. Windows 2.0 was more than success story Windows 1.0. Where more Third Party Software made for Windows 2.0 than Windows 1.0. Windows 2.0 have first Word and Excel for Windows and was first killer apps for Windows. Windows 2.0 was successful as Run Time Software. Sometime People Overlook Impact it Windows 2.0 have in Computer History. Nice Find Someguy. I don't quite understand what you are trying to say, but thanks, I think. ZSoft Publisher's Type Foundry - Winworld has the Windows 2 version. hDC ClickStart - Winworld has the later renamed hDC Windows Express for Windows 2. Micrografx Windows Graph - There are photos of this in various Microsoft literature, but no version of this has turned up yet. It's just a demo version, but at least it is something, and now I can tell that this became Micrografx Charisma. Omnis 5 is copy of Windows 2.x? Glad somebody picked up that copy of Omnis Quartz. I had been eyeballing it for some time, and just when I decided to buy it, somebody else snatched it up. Glad they uploaded it here.